As a mom, I feel like one of my roles is to make sure childhood is special for Ethan. People often tell me "He's two, he's not going to remember any of this." and they are probably right. He won't exactly remember every little thing we do for him, but I do feel like it will make some sort of impact on him in the future. Traditions will be ingrained, thoughts and feelings will be formed and if all else fails there will at least be photographic and written proof for him to look back upon one day. Sometimes though I wonder if I'm forcing things too much. Take for example our Christmas tree adventure this year. 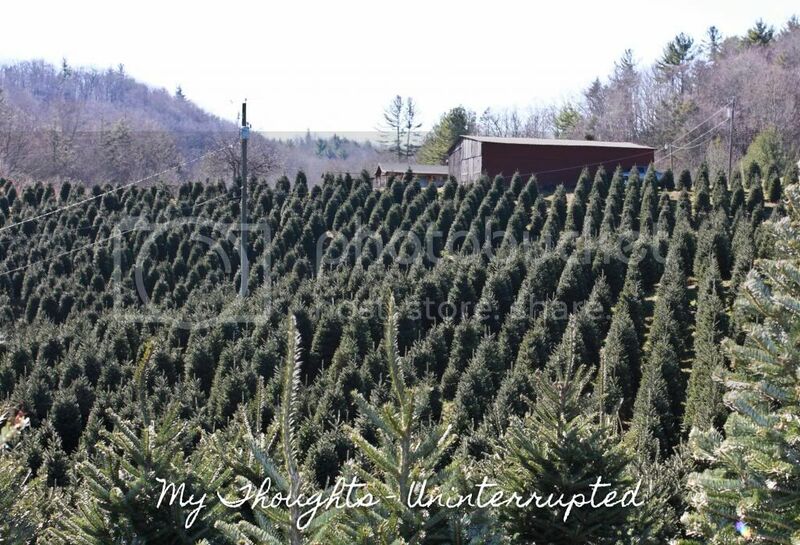 And no, this isn't our first Christmas tree adventure...in fact, it tends to be a fairly consistent thing for our family as described in this very old post. 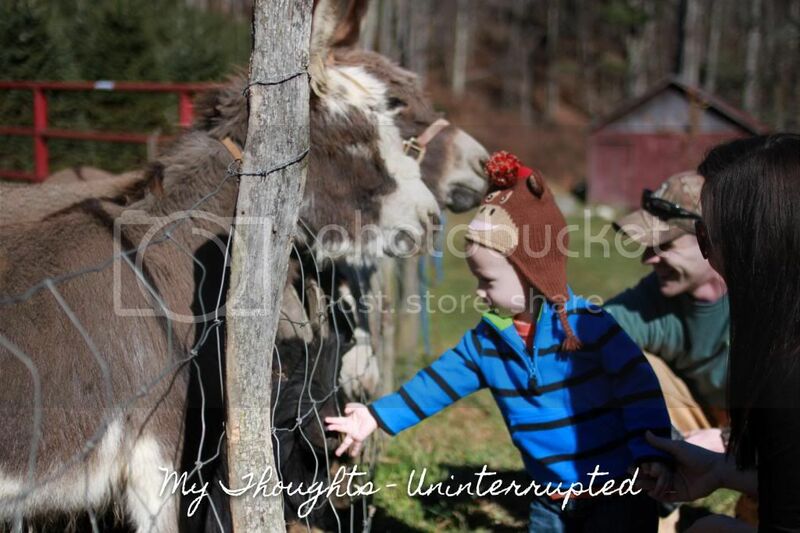 Being back in East Tennessee made me want to introduce Ethan to the whole chop your own tree down experience. 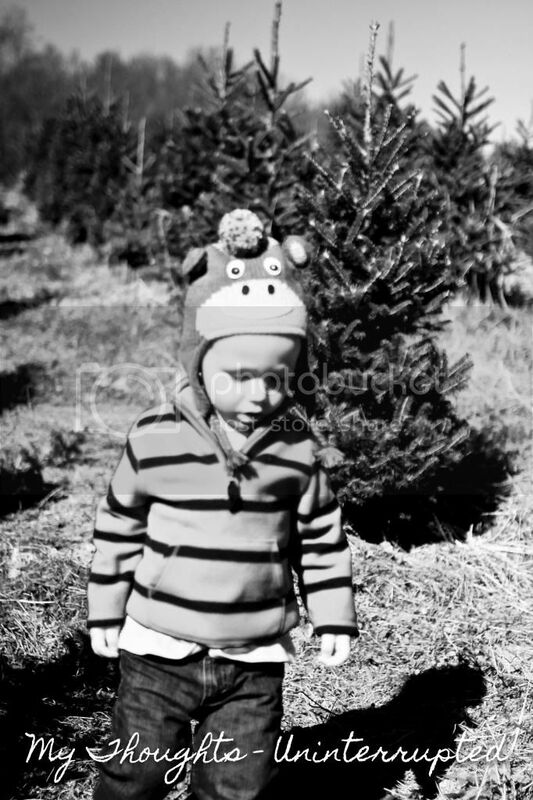 The past two years we've tried but failed (due to my utter hatred for pines) to find anywhere amazing to take him to get a tree and the experience has been a little lack luster to say the least. So this year I decided to make it extra special. It turns out that our new home is only a mere 2.5 hours away from the home of the beautiful Frasier Fir tree (my absolute favorite type of Christmas tree). It only grows in North Carolina and possibly Colorado due to the elevation requirements so it is sort of an unique experience. I envisioned a pancake breakfast, a fun ride of Christmas carols, Ethan being in awe of so many trees and maybe some hot chocolate. Obviously you can tell where this is headed. Apparently I had forgotten I had a two year old. The pancake breakfast that I was sure would be a hit ended up with me mostly eating alone (not that I minded) and my husband taking wild child toddler outside so we didn't disturb the other patrons. The Christmas carols were sung amidst the screams of an unhappy car rider who insisted on telling us he was "stuck" in his carseat the whole way. Yes kid, you are strapped in and have been all your life. We arrived frazzled, but hopeful to one of the largest tree farms I've ever seen. As we received our instructions on tree hunting Ethan spotted a tractor and was overcome with joy. As we headed for the trees he began pulling back saying "Tractor! Tractor!" and I knew that our trip had ended before it have even begun. He could have cared less about the trees. There was no magic. It was a battle of wills until the end. Quickly the special tree hunt became like one of those bad grocery store trips in which you just grab and go. Except tree hunting is a little more time consuming and difficult. It wasn't all a total loss though. 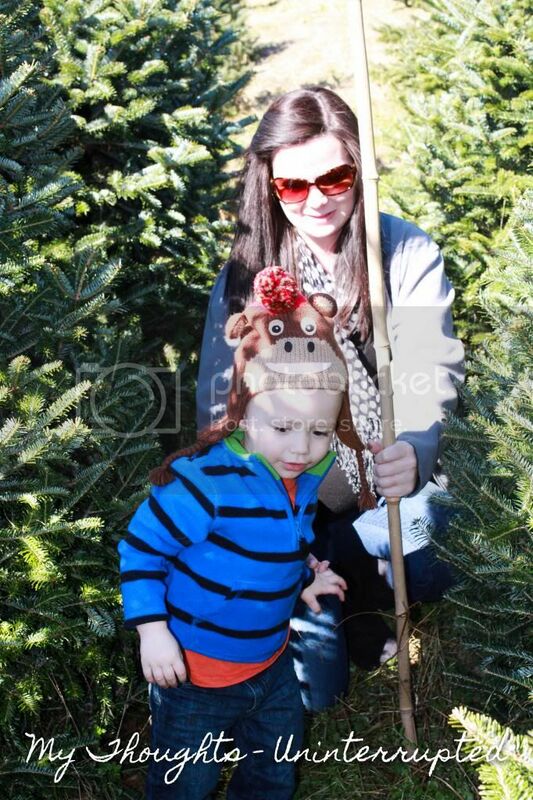 He did become fascinated with the farm animals long enough for me to finally find a tree. 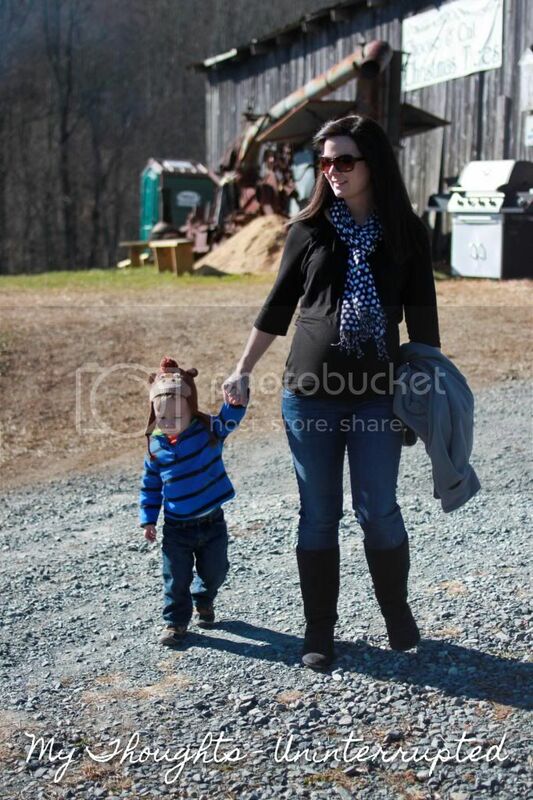 And of course we finished off the experience with the hay ride he was just dying to take. The trip home isn't even worth mentioning. It was a complete disaster due to an overly hungry toddler and our lovely Garmin taking us in a direction of absolutely no civilization what so ever. Life with children is such a delicate balance. Sometimes even the best laid plans can turn disastrous. As my husband started to lose his cool, I wondered why the heck I had even tried. I began to feel sorry for myself and even began to question my true reasonings for the trip. Was I just being selfish and trying to do this solely for myself? Instead of a magical trip of fun, everyone was just frustrated. As a parent, I'm realizing that special memories and traditions don't just happen on their own. There is always some effort that has to be put behind it. I guess I never saw that as a kid. I look back so fondly on my own childhood Christmas traditions now although I'm sure my parents have some stories like these of their own. Visions dashed, frustrations high. It might all seem to be a lost cause at the time. Deep down I know that I do partially do these things for myself. I want to experience special moments with my kids. I don't want to feel regret for not putting in the effort. I want my kids to feel loved, to feel special, to have wonderful memories. I know in years to come that Michael and I will be laughing about this trip just as we have with all our other Christmas Mis-adventures. And no, Ethan won't remember this particular trip, but hopefully over time (and many more trips) he will develop a love of Christmas traditions and pass that on to his own family one day. The toddler years are tough, and sometimes I have to remind myself that it's truly the simple joys that make him happy. I know that elaborate plans aren't always necessary, but the effort is always worth the memory. I don't regret a single moment of this trip. Everything may not have been picture perfect, but I know that one day we will all look back upon it fondly. The memories of frustration will fade into laughter and the spirit of tradition will hopefully live on. I was just thinking the same thing. This year is our first with our baby, and I want to make this season so special, filled with traditions. But I have to realize that it won't always be perfect and we may not be able to make it. I can't put too much pressure on myself otherwise I am setting myself up for disappointment. It still looks like he had fun!! I love this post Laura! It's totally our Christmas season this year. He just could really care less about it. I need to be a little less selfish about it. The traditions, the excitement--it will come. They are just so young right now and it's their simplicity that we could learn from.